If you need a starter or an light aperitif in no time especially when you do not wish to cook at all, understandable when you are in full christmas mood shopping, this supersonic recipe is for you! It is sooooooo easy, there is slightly any preparation at all, just a blending of 2 ingredients and ta-daaaah! With a crusty or toasted bread, this little gem will pleased absolutely anyone! Wine pairing : Gers (White) from the South West. Mix roughly the prawns with a food processor. In a lovely bowl, mix evenly the butter with the prawn to have a lovely, smooth "buttery" texture. Place the prawn butter in the fridge for 1 hour. Mixez grossièrement les crevettes à l’aide d’un robot culinaire. 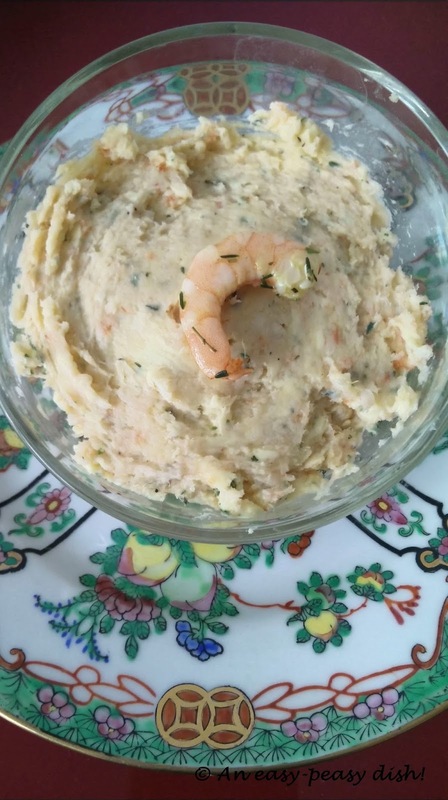 Dans un bol, travaillez le beurre avec les crevettes et le poivre afin d’obtenir une texture « pommade ». Placez ce beurre de crevettes au frais pendant 1 h.
Dégustez avec du pain frais ou toasté.